Stitching Dreams: 2017 Parade or Ornaments! And here we are on December 20th--the very last day of autumn! Welcome to my 2017 "Parade of Ornaments"--one I thought just might not happen given the busyness of my life over the past 12 months! 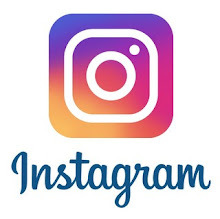 Many people have told me that this annual post (which I have done since 2010) is what drew them to my blog in the first place. So, I really didn't want to let any of you down and have to cancel the parade this year! I know there are some wonderful new followers (a big welcome to all of you!) this year, and if you would like to look back at my previous "parades," just click here: 2010, 2011, 2012, 2013, 2014, 2015, and 2016. So, grab some hot cocoa, wrap up in a cozy blanket, and sit back and relax as the parade passes by! In looking at my finishes this year, I would call it the "year of oval or round finishes"... and there is a good reason for that. Remember when my sewing machine broke back in April? Well, for a while I couldn't sew on it at all so I resorted to circular finishes. After we oiled and cleaned the machine, it seems to work just fine so I could resume making my little pillow ornaments. But, you know what? I discovered that I truly love doing the round or oval shapes! So, I'm sure you'll be seeing more of them. As most of you know, I hang the newest 12 ornaments on my banister and then move them to the tree as Christmas approaches. As always, I love to hear what is your favorite (or favorites!). I'll give you a closer look so you can make your decision... And if you want more information on fabrics or fibers that I used, just click on the name of the ornament below the photo--it will take you right to the post describing each finish. 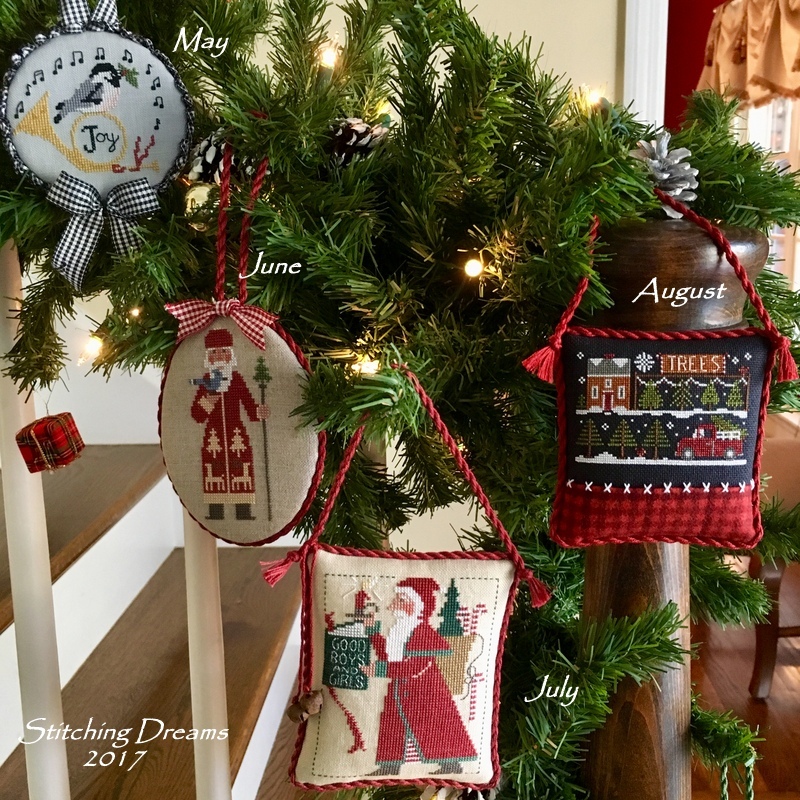 Little House Needlework's "Tree Lot"
Hands On Design "Silver Bells"
So, now it's your turn--which is your favorite? Is it one of the six Prairie Schoolers I stitched this year (yes, I am a PS addict and I embrace it!) or one of the others? For me, it is a tie between the LHN "Tree Lot" with all of it's tiny details and the sweet "Kissing Cardinals." But, I'm proud to add each one to my Christmas tree. Speaking of which... I finally got my tree decorated and am just putting the final beads on... will definitely post a photo when I'm finished. Favorite, Silver bells followed by Trees. I admire anyone who stitches on black, i did once and never again! Your bannister looks wonderful, Happy Holidays. Dear Carol, your house is beautiful, you have a beautiful Christmas decoration! I wish you peace and love filled Christmas holidays! Beautiful! My favorite is Silver Bells! Everything looks great Carol. My favorite is The Tree Lot (yet to be stitched) followed by Good Girls and Boys Santa. Silver Bells is delightful with the little added bells! I LOVE the oval finishes! Have a blessed Christmas and a healthy and Happy New Year! My favorite from your parade of monthly ornaments is the kissing Cardinals! But, of course, I LOVE them all. They are all beautiful, Carol, but my favorite is the same as a number of previous posters...the Tree Lot on black. You've had quite an exciting year, and I hope it's not too late to wish you a Happy Retirement. I know you'll get lots of stitching done in 2018. It's just the most wonderful problem deciding what to stitch next! 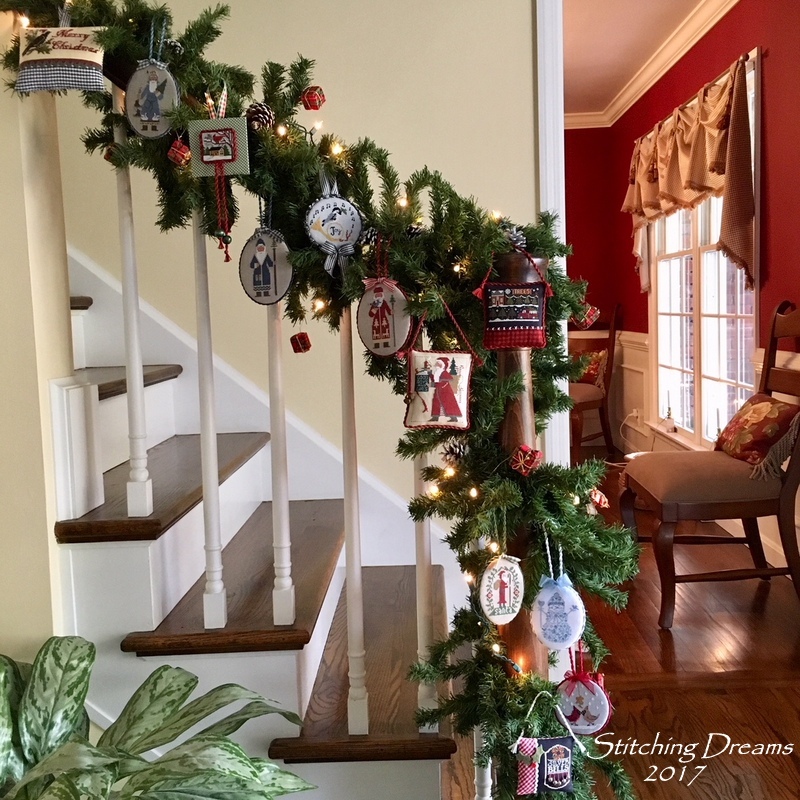 Carol, your ornaments are amazing! 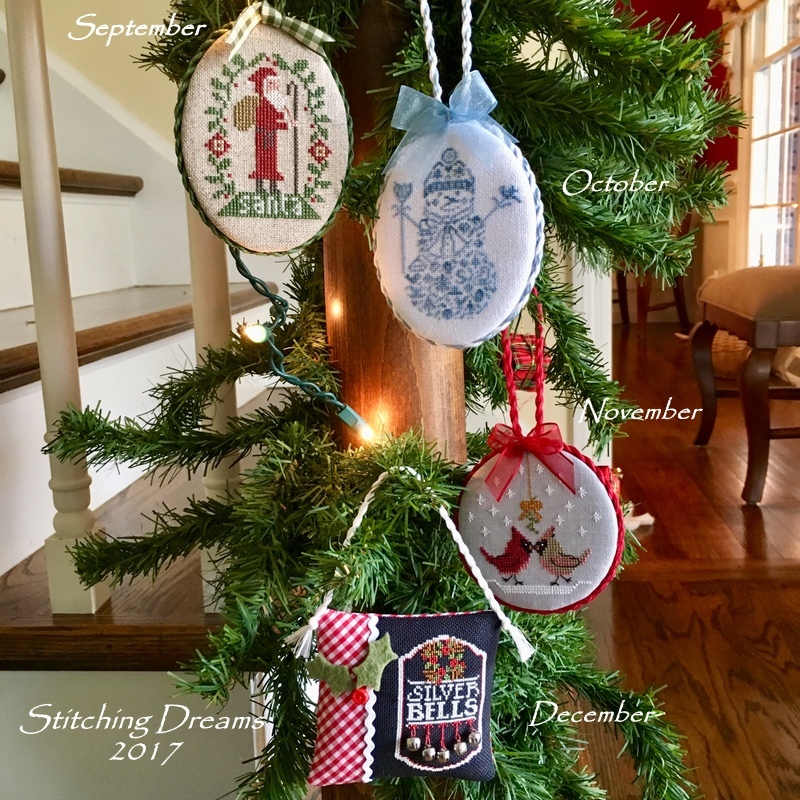 I just started stitching again (last January) after many, many years and I have little to few ornaments, but I do enjoy yours! The tree lot is my favorite among this group...your finishing is wonderful! Carol, these are truly magnificent! Congrats on all of the gorgeous ornaments Carol. My favorite is August. I love that little truck. Hi, Carol! My favorite is a toss up between the tree lot and the silver bells. I just love how you finished silver bells with the little jingle bells. Your finishes are so well done! Merry Christmas! well--you get the idea--they are all very lovely and very well done!! Love your red dining room in the background! I also vote for Tree Lot. There's just something about the black fabric with all the other colors that works so well. Merry Christmas! Too hard to choos, Carol. I can't decide between February and November Another great year of ornaments. Can't wait for the tree pics. Carol, you have created 12 more beautiful ornaments for your 2017 Parade of Ornaments. It is hard to pick one so I will pick the kissing cardinals, the tree lot, and the sweet little house with the cardinal from March. Wishing you a Merry Christmas! The Tree Lot is my favorite but they are all fantastic. For me it was a tie between August and October. I hope you and your family have a very Merry Christmas!! Such pretty ornaments! My favorite is Sleight Bells. My favorite ones are the ones stitched on black. They are SO striking! I also like the PS ones, they're a classic. How do you get your rounds and ovals so round and oval? It's a finish I haven't done before and don't know where to start! Wishing you and your family a happy holiday season - and a safe one! I am a big fan of all, but first place is May with the birds and music notes. Second place is February with the PS Santa. Such a treat to see all your ornaments for this year! I'd have to say my favorite is either one of the PS Santas or the kissing cardinals. Love those cardinals! So maybe that one. :D I hope you have a wonderful Christmas! Love the parade. The tree lot is my favorite but it's so hard to pick one. They are all precious. I hope you get some time to relax. I know some pictures will be posted about baking 😆. Merry Christmas 🌻 to you and your family. February, April, and June of course! I try to stay away but keep going back to PS! I love the banister display. Never tried the oval/circle finish as you did. Maybe it's time. Gorgeous as always Carol. I have to say my fav are the PS Santas. Have a wonderful Christmas and Happy New Year Carol. They are all so cute! But if I had to choose one, it would be February. I love PS Santas too! Thanks for sharing and have a Merry Christmas! Tree Lot is my favorite because it is on black fabric and the colors really pop on black. Can't wait to see your tree though! I see it on Pinterest every now and then. I really like round finishes, I need to do more. Take care Carol! I am so glad you have managed to treat us to an other year of wonderful Christmas ornaments! As always, they are all beautifully stitched and finished. My favourite has to be August. I love the fact you've stitched it on a dark fabric and the finishing look simply stunning. Wishing you a Happy Christmas and a Prosperous New Year. all your new ornaments are wonderful. I like them. My favourite are the kissing cardinals. They are very cute. Well done Carol for yet another wonderful display of your beautiful stitching . I do love those cute birds in November , but you know me I love them all. 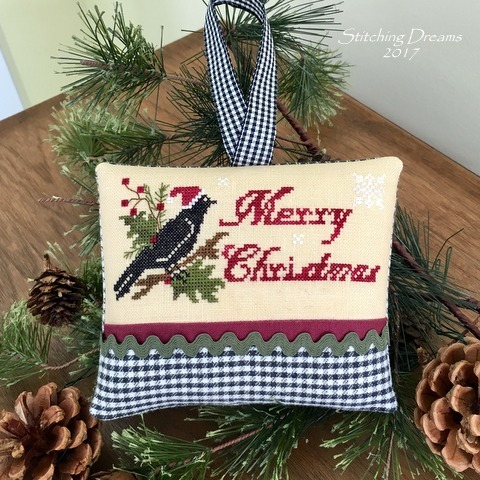 Hope you have a wonderful Christmas lots of rest , maybe some stitching ha . Also a Wonderful and HAPPY NEW YEAR . If I had to pick one, it would be Tree Lot. Oh, what a nice idea with the parade - I have already looked at the others, and have a great desire to try it once. My Favorite is from May - Joyful, but also the June - PS Kris Kringel. Oh, they are all pretty. Now I'm waiting for your tree. What a beautiful day when you post all of your stitchy goodness!!!!! 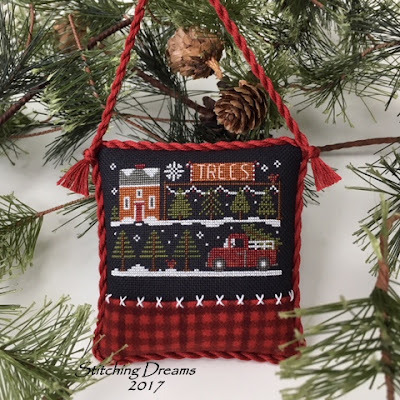 My favorite is the tree lot with all of the details and especially the red and black checked fabric on the bottom, absolutely gorgeous. Thanks so much for sharing all of this, it truly makes me so happy. Congratulations on such a beautiful 2017 collection! Thank you for this festive and cheerful post Carol. I wish you and your family, a very Merry Christmas. thank you for the look at all you wunderfull ornaments. I can not say which one I like better, but the oktober snowman i have to remember! I am very happy that you did your ornament parade Carol,I love being able to click on each one to see the beautiful details. I love all of them,but if I had to choose a favourite it would be Tree Lot,it is such a pretty design. Merry Christmas to and your family Carol. They're all beautiful but I will go with the PS Cardinal because the finishing is like a picture frame and I like the dangling strings with large round beads. I love seeing your 'parade' every year so thank you for taking the time to share with all of us! Have a wonderful Holiday with your family! My dear friend, oh what a wonderful parade! I really love them all ... but ... I do have a favorite. And a clear one (I think that did not happen ever in all the years past, when I watched your parade). I am an TPS-addict too. Absolutely! And I LOVE LHN. But my very favorite of this years parade ist this gorgeous "Silver Bells"-ornament. It is so pretty and sweet. And the little bells on it. Just stunning. Wishing you a wonderful Holiday, my dear friend. What a great way to display your ornaments! My personal favorite is October. Merry Christmas to you and your family, Carol! Each are beautiful, unique and so very well done! A blessed and Merry Christmas to you! Love each and every one of them. I so enjoy watching the parade of ornaments. I'm just going to have to learn how to do the round/oval finishing. I guess my favourite would be P.S. Cardinal. It is so bright and lively in the foreground of the design. As amazing as always Carol! I think August is my fave, I love the black fabric and it's such a cute finish. Love the kissing cardinals. I just finished my tree lot , but it's a lot bigger than yours. Picking a favorite is impossible for me because I love each and every one! : ) I'll look forward to seeing your tree! What a year for you Carol! Glad you made it to the finish line with your ornaments! I love the oval finishes - haven’t tried one of those yet, but my mom has the templates, so I will have to do that soon! I have to say my favorite this year is Tree Lot - something about the tiny trees and the truck, but I do like them all! Hope you have a lovely holiday with joy and time to relax and stitch! I was definitely looking forward to seeing this year's ornament parade on your blog. Lucky you that you managed again to stitch and finish all 12 of them. And they are all so sweet. So beautifully stitched and finished. Choosing a favorite, well, that's more than difficult. I'm partial, I know, I'm a Prairie Schooler fan, so I would always choose among the Prairie Schooler ones. But among the others it would be the Tree Lot by LHN, a very sweet design. Wishing you and your family a wonderful Christmas time. Oh, wonderful - all stitched, all finished and looking absolutely beautiful featured there on your banister. 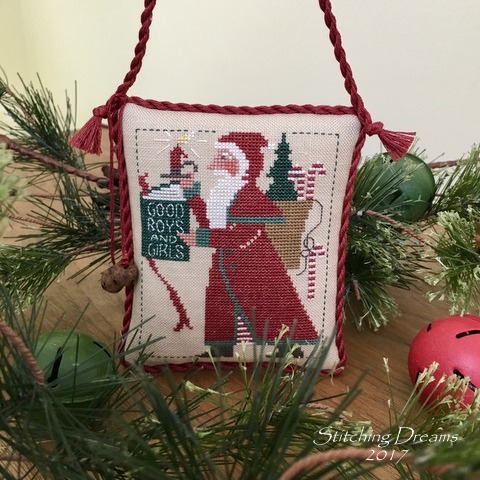 The Kissing Cardinals are adorable, but I think my favorite is Samplers Not Forgotten's Merry Christmas ... which I have undoubtedly paged past in the magazine a dozen times or so and somehow never flagged it to stitch. You can be sure it's marked now! 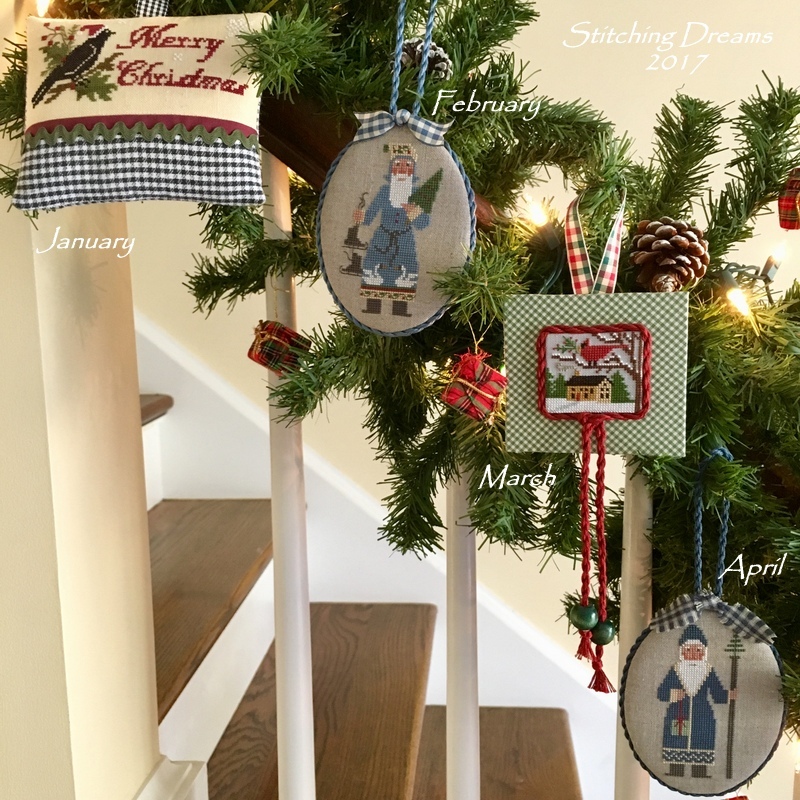 It's so much fun to see what you picked to stitch and how you've done your finishes - thanks for this fun Christmas tradition. I love PS Old St. Nick and Tree Lot! They are ALL absolutely gorgeous!!! What a neat way to display them on the banister like that!!! Just stunning!!! All your ornaments are beautiful, Carol! Carol, your annual parade of ornaments is always a treat. My favorites this year are Merry Christmas, Tree Lot, and Silver Bells. Merry Christmas to you and your family. Congratulations on finishing your ornaments this year! I love the way you showcase them on your banister. My favorite would be "tree lot" and "silver bells." 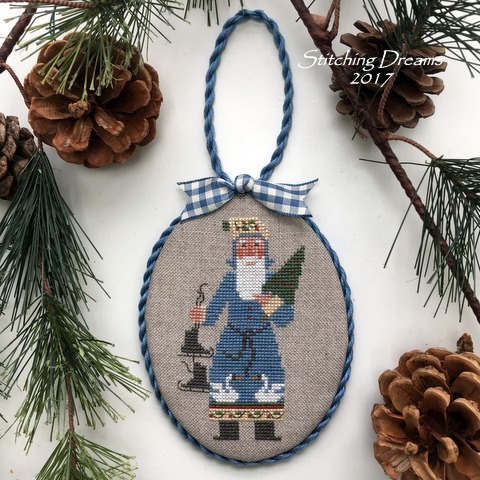 I loved "silver bells" so much I bought the pattern to stitch this next year. You've inspired and encouraged me to renew my love of stitching. Wishing you a Merry Christmas! Oh, my favorites are the ones with birds. Or the ones with plaid trims. And the back fabric stitched ones. Gosh, I don’t have to choose just one, do I? I look forward to seeing this post every year, Carol! They are all lovely Carol and beautifully finished. February, March, April, and August I find to be especially appealing. Merry Christmas to you - have so enjoyed reading your blog this year. Twelve beautiful ornaments. I failed miserably this year! Favourite ... well I love the PS Santas, love Santas of any description but if I really had to choose, either January or August. So beautiful! It's remarkable that you kept right on throughout such a busy year! (Although that might have been what kept you sane!) Tying for my favorite: SNF Merry Christmas and BH&G Joyful. Some of those designs from older publications are so pretty! Merry Christmas! They are all absolutely gorgeous, but I think December's silver bells is my favourite. Beautiful ornaments so neatly and differently finished and all to be treasured. Couldn´t possibly choose a favourite. Wonderful decorations and photos that should be put in a magazine and will give me inspiration for next year. Merry Christmas. Oh my goodness! They are all so wonderful and your finishing is superb! I think my favorite is the May ornament. I'm glad you found time. I love seeing all your beautiful ornaments. I agree with you. Tree Lot and the Kissing Cardinals are my favs by far. Love them all though of course. Love them all, but Tree Lot is my favorite. Might ave to add that to my ornament list. I love it stitched on black and it's just a happy scene. I look forward to your parade of ornaments each year! Happy New Year! I'm probably the last person to comment as I'm late to the party! I love the idea of displaying the ornies on the garland. My favourites are the Tree Lot and the Jingle Bells. 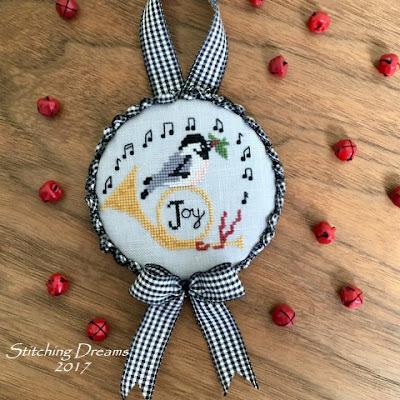 I just adore over one stitching and the little bells are the perfect finishing touch. I look forward to this post every year! Your work is so beautiful Carol, it must make you so proud. I couldn't pick a favourite, they're all so charming. I hope you had a lovely festive season and a happy start to the New Year.